I know this book too, and I found some "oddities". On one of the very first pages for example it mentions "oxygène" and here clearly the element is meant. However it was in 1779 when Lavoisier suggested this name for that element. So this book by far isn't as old as Steiner wants us to believe it is. Do I need to mention he's implying that B.V. himself might have written this book? It isn't that clear as well. One would need the key for the key of the twelve keys..
His (Steiner's) other works are great though. I think his Fulcanelli translations are really awesome. The translation of the comment about the Mutus Liber by Canseliet is well done as well. 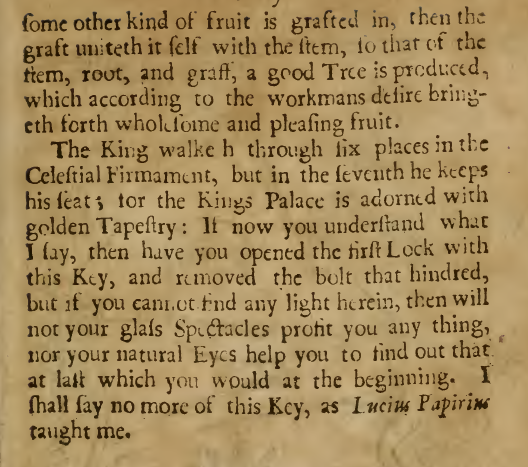 How did the author of this commentary interpret the first keys? Everyone else I have seen so far who has commented on this (even Clinge and Kunckel) interprets the first keys in very similar fashion. Obtained a copy of this text recently. Looking forward to reading it. May have thoughts to share after. If so I shall update this post with them. Because everyone else starts with the First Key. Beginning with the first paragraph of the text, we see that Basil Valentine is speaking of our Starting Matter: "Know, my Friend, that impure and defiled things are not fit for out work; for their Leprosie, can be no help in our operations, that which is good is hindered by that which is impure. All wares sold from the Mines are worth one's money, but when they are sophisticated, they are unfit for use, for they are counterfeited, and are not of the same operation as they were before..." Frequently Masters describe our Starting Matter as coming from the mines, and Basil Valentine confirms that this Ore is indeed of value, but not when it is sophisticated i.e. treated improperly from the get-go, because if we ruin our Ore from the start it will not be fit for use in our Work. We need to prepare this Ore properly. Which is why I often repeat that the very first step in our Art is Preparation. 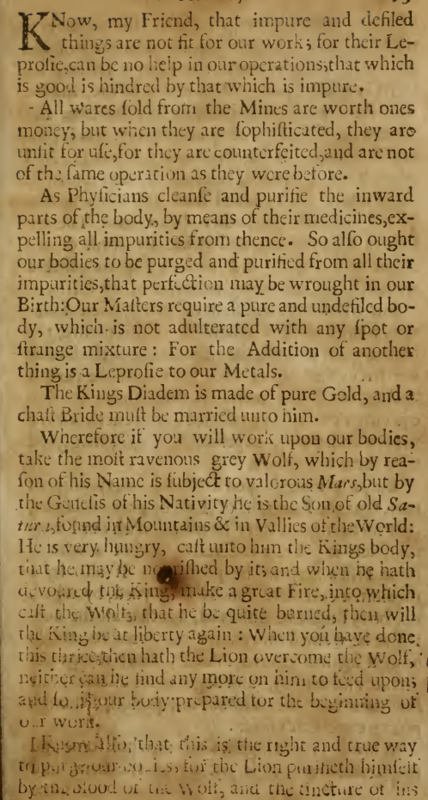 "...As Physicians cleanse and purify the inward parts of the body, by means of their medicines, expelling all impurities from thence, so also ought our bodies to be purged and purified from all their impurities, that perfection may be wrought in our Birth: Our Matters require a pure and undefiled body, which is not adulterated with any spot or strange mixture: For the Addition of another thing is a Leprosie to our Metals..." This paragraph is revealing to those whose eyes are opened. I will not comment on the esoteric aspect of the paragraph, but rather focus on the more exoteric part. Notice the capital letter 'P'--he is speaking to us--we are the Physicians who are to purify the inward parts of this Ore. And how do we do this? We expel the outward impurities present in our Starting Matter! Because just as JDP incessantly rants and raves about, no matter is found in Nature that is already prepared and waiting to be picked up by the Artist and put into a flask to turn into the Philosopher's Stone. We must prepare it first. Basil Valentine knows as we all do that this Starting Matter is composed of many constituents, just like was discussed previously, and that nothing is added once this Matter has been collected. It is left to us Physicians to remove the excess superfluous junk present in our raw Ore so that it may become properly prepared and thus fit to begin manipulating inside our flask. "...The King's Diadem is made of pure Gold, and a chaste Bride must be married unto him..." This is a direct statement, meant to be taken at face value, although to say literally would be improper because no human king is marrying some human bride. What is a diadem? A diadem is a type of crown or headband worn by royalty that comes from a Greek word that means 'to fasten'. We are told that this upper band is colored gold, and we know that a chaste bride has no impurities and therefore is signified by the color white. What happens when a pure White substance is combined with a royal Gold substance??? This is a later part of our Work being briefly mentioned, whereas if we look at the paragraph below we are told what happens earlier. "...Take the most ravenous grey Wolf, which by reason of his Name is subject to valorous Mars, but by the Genesis of his Nativity he is the Son of old Saturn, found in Mountains and in Valleys of the World...." What is our Wolf? Note that if we look at the visual of the First Key we notice that the wolf is depicted as jumping. This is a clue to the initiated. Our Wolf is the son of Saturn (our Blackness), subject to Mars (in this context the Red Earth of Hadamah). Valentine tells us exactly where we are to find this Wolf: in Mountains and Valleys of the World i.e. in the midst of our flask. This is neither our Fixed Salt nor our Astral Salt, but something else...similar to sperm which is found in the midst of our flask. "...He is very hungry, cast unto him the King's body, that he may be nourished by it; and when he hath devoured the King, make a great Fire, into which cast the Wolf, that he be quite burned, then will the King be at liberty again: When you have done this thrice, then hath the Lion overcome the Wolf, neither can he find any more on him to feed upon; and so is our body prepared for the beginning of our work..." When we combine these substances in the belly of Saturn by making a big Fire (the Philosopher's Fire....remember "Alchemists burn with Water") the King's body is burned and our Wolf is overcome by our Lion. Notice that all of a sudden Valentine starts talking about a Lion. What is our Lion? Lions are known as the kings of jungle. Our Wolf has transformed into our Lion who is our Earthly King--ruler over the Earth...the terrestrial counterpart to our Celestial King reigning over all. By the way, this Matter is where many authors begin their treatises. Our Lion is the First Part of our Work completed, the end of the First Turn of the Philosophic Wheel and the beginning of the Second Turn. "...I Know also, that this is the right and true way to purge our bodies, for the Lion purifies himself by the blood of the Wolf, and the tincture of its blood wonderfully rejoyceth in the tincture of the Lion, for both their bloods are nearer of kin one to the other; when the Lion is satisfied his spirit is made stronger than it was before, and his Eyes shine with great splendor like the Sun, and his inward Essence is of great efficacy, and is profitable for any thing you apply it unto..." Of course both their bloods rejoice together...because they are of the same Body! These two substances mingling together augment each other to a higher perfection, which when perfected is profitable to the Artist. Oh, look! A metaphorical description of our Lion "...whoever drinketh from this golden fountain..." and the text later goes on to explain again that this must be absolutely pure. 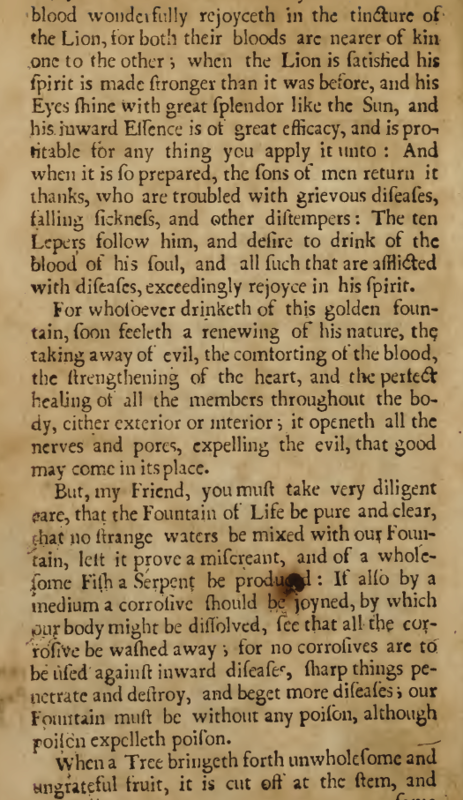 The part about "...and of a wholesome Fish a Serpent is produced..." is discussed further in this thread. "...When a Tree bringeth forth unwholesome and ungrateful fruit, it is cut off at the stem, and some other kind of fruit is grafted in, then the graft uniteth itself with the stem so of them, root and graft, a good Tree is produced, which according the workman's desire bringeth forth wholesome and pleasing fruit.." is a hint at an abbreviation, a process the Artist can carry out once we have exhausted our Tree of its supply of desirable fruit. "...The King walketh through six places in the Celestial Firmament, but in the seventh he keeps his seat..." We know that our King is Philosophical Gold hence ...the King's Palace is adorned with golden Tapestry...", and the King walks through six places is a reference to the six inferior metals, the seventh being gold. "...If now you understand what I say, then have you opened the first Lock with this Key..." In conclusion, the main focus of this First Key is the completion of the First Rotation...the manifestation of the Earthly King...our Lion. Which is confirmed in Basil Valentine's "Elucidation Of The 12 Keys"
Last edited by JDP; 08-10-2018 at 02:07 PM. Schmuldvich is right with the grey wolf and it's connection to mars and saturn. Being black and having other properties it's related to saturn. And it's related to mars. Mars is the god of war and in war in former times pikes were used which were usually made of iron (mars). The german word for the black antimony ore was "Spießglantz", literally meaning "pike shine". There should be little doubt that here the antimony ore is meant. In addition melted antimony ore "dissolves", "melts", "eats" all metals very quick (the quick jump over the fire). Letting the wolf go (in heating the mixture to very high degrees) subsequently after repeating it three times leaves the "king" of metals(gold) behind in a very purified form. This is what Franz Clinge, Michael Maier, Kunckel, an anonymous from the 17th century and Lawrence M.Principe think about it. I may add some more interpretations later. Links to private forums can not be viewed by non-members. But he is not right. He thinks that all of this has to do with the mythical "one matter" that he actually thinks exists somewhere in nature already made for his convenience.